Portal 2 will be more than a return to Aperture, it'll also be the best project Valve has ever done. It would be an understatement to say that Valve makes good videogames. With Half-Life, Half-Life 2, Left 4 Dead, Team Fortress, Portal, and various other extremely popular games under its diamond-encrusted belt, the company is always at the top of its game. So, what does it mean when Valve says that Portal 2 is going to be its best product ever? It means that you should probably get some money out right now. 1up was able to take a few minutes with Valve top dog Gabe Newell at GDC this week, where he made it clear that Portal 2 is planned as a pretty big project. After the success of Portal, he says: "We got the signals that we wanted -- this is what people liked; this is what people didn't like. 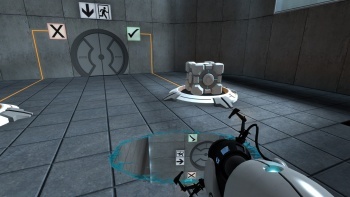 And to us, it was like, 'OK now we know how to take this big,' so that's what we're going to do with Portal 2." Already, Newell feels: "Portal 2's great. It's the best game we've ever done." Why does he think this? "It's pretty clear, just internally," he says. From the company that basically changed the FPS genre, this is a huge statement. In addition, as if it wasn't expected, Newell hints that Jonathan Coulton will be back in Portal 2. Coulton composed "Still Alive," the popular ending song from the original Portal that is still being covered by legions of YouTube users today. "Jonathan Coulton is awesome -- he's just brilliant; he's a joy to work with," Newell teased. When asked if there would be another Coulton song in Portal 2, Newell only said: "He's brilliant." That's a yes. I don't know about everyone else, but after also reading about Portal 2's leaked details, I'm more than a little excited to equip my portal gun again.